A strong collection, to be sure. 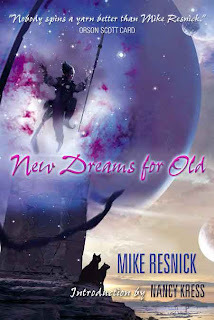 It certainly highlights the range and contrast in Resnick's short fiction, a reflection of the multi-faceted nature of the author himself, which Nancy Kress comments on in this appreciation. Humor is hard to pull off, and I'm not sure how funny readers will find the "lighter" pieces, such as the John Justin Mallory tales. They do provide a nice diverting balance, though. There's little room to disagree about the quality of craft and emotive power of such "serious" (I use quotation marks because there's typically an undercurrent of irony, if not a few outright sarcastic moments) stories as "Travels with My Cats," "A Princess of Earth" and "For I Have Touched the Sky." The endings of these stories are not necessarily startling, but getting there is no less rewarding for it. I also particularly enjoyed the outright (un-? )religiosity of "The Pale Thin God" and the unnerving implications of "Old MacDonald Had a Farm." And who can forget the sideways feel and dream-like logic of the mordant, irresistibly-titled "The Elephants on Neptune"? These are new dreams for old, as the title indicates; or, put another way, old dreams made new. And they're substantial enough to continue to be made new each time we re-read them.